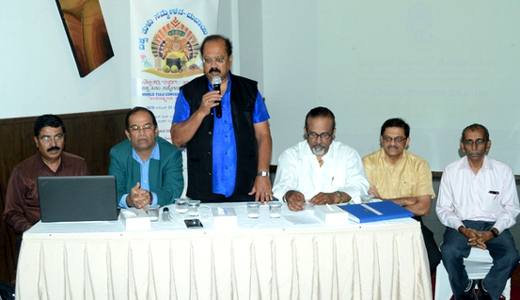 Dubai, Nov 11, 2018: Vishwa Tulu Sammelan will be held for the first time in Dubai on November 23 and 24 under the aegis of the Akhila Bharatha Tulu Okkoota and Karnataka Tulu Sahitya Academy at the An Nasr Leisureland Ice Rink and Nashwan Hall. Dharmasthala Dharmadhikari Dr D Veerendra Heggade will inaugurate the Tulu Sammelan. A souvenir named Tulu Aisiri will be released on the occasion. Several dignitaries including NRI businessman Dr B R Shetty, Mangaluru Diocese Bishop Dr Peter Paul Saldanha, Bellary Bishop Fr Henry D’Souza, Sri Sugunendra Theertha Swamiji of Puttige Mutt, Sri Gurudevananda Swamiji of Odiyoor Mutt, entrepreneur Ronald Colaco, Alva’s Education Foundation Chairman Dr Mohan Alva, former minister Veerappa Moily, Karnataka Minister for Kannada and Culture Jayamala, DK District Minister U T Khader, UAE Tuluvas President Sarvottam Shetty, Akhila Bharatha Tulu Okkoota President Dharmapal Devadiga and others will grace the occasion. A host of programmes including literary and cultural events will be held as part of the Sammelan.